PASCO – Edgar Brown Stadium became Oz on Saturday. But if there was any doubt the accomplishments of the Rogers girls track team were almost make-believe, the ending to the State 4A track meet erased that. Becca Noble, running against the best 4x400 relay teams in the state, made up almost 50 meters on the anchor leg to give the Pirates an improbable and magical victory. It was Dahl, the Rogers valedictorian and Dorothy in the school production of The Wizard of Oz, who started the surreal day, winning the 100-meter hurdles in the morning and adding the 300s in the afternoon. And perform is what Noble did, taking center stage of a terrific track meet. She was fourth in the 100, set a meet record in defending her 400 title and powered into a strong headwind to win the 200. Then she did the inconceivable, running down five runners and bringing the crowd to its feet to cheer for the fairytale ending and a time of 3 minutes, 58.89 seconds – .02 better than Eastmont. It all added up to 55 points, just nine behind repeat champion Curtis. It was the best finish for Rogers since the 1986 team won it all with Kellie Gamby and Keryn Shines as the stars. The Pirates did it with five participants to the dozen for Curtis. With the five wins by Rogers and four others by Greater Spokane League individuals Friday, Spokane won nine of the 18 events, believed to be an unprecedented accomplishment for one league, at least one that had no more than a shot at a quarter of the entries. The Mead boys also finished second, scoring 41 points, 15 behind repeat champion Inglemoor. Panthers senior Evan Garber won the 1,600 meters to give him the distance crown of cross country and both long races on the track. However, he was the only GSL boy to win. A year ago, when Mead finished seven points behind Inglemoor, the GSL boys won four events and the girls two. The sunny, windy day got off to a rocky start for the Pirates when senior Cassidy Caldwell was a disappointing ninth in the pole vault, despite clearing 10 feet. But part of the miraculous ending was Caldwell stepping in for injured freshman Lindsey Anderson to run the third leg of the relay, possibly making her the fastest pole vaulter in the meet, she said holding her gold medal. Watching her teammates rack up gold medals all day eased her fears. “That made me feel better because I knew they would compete,” she said. 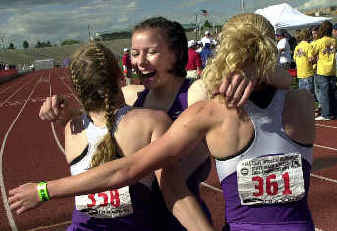 It all started with Dahl, who charged into the headwind to become the first GSL girl to win the 100 hurdles. Her time of 14.74 seconds was only bettered by the 13.90 of former Central Valley star and current Mt. Spokane coach Annette Helling Pedersen 23 years ago. Dahl’s time in the 300 of 44.66 was the third-fastest by a Spokane runner and made her just the second champion. Helling won in 1981. Dahl turned out for track because the pole vault looked fun and tried the hurdles because her dad was a hurdler. “I was only a 9-foot vaulter so I decided to focus on hurdles,” said Dahl. The rest of the day belonged to Noble. She ran 12.33 in the 100, well behind Decatur sophomore Princess Joy Griffey. The 400 was a cakewalk, despite the wind. Her 54.31 just clipped the 54.34 by Tiffany Giles of Garfield in 1998 and was 2 seconds clear of the field. Then she mentioned that she had a dream she won the 200, which she did, joining Shines (1986), Gambie (1987) and Teresa Brooks of Lewis and Clark (1999) as state champions. Her time was only 25.12 into a strong wind, but her Friday preliminary of 24.74, matched by Griffey, was a school record. That’s what she did in the relay, which junior Krystal Crawford leads off. “Down the home stretch, when I saw how close they were, I kept pushing,” Noble said. She thought she won, but the race was too close to call and the crowd sat in stunned silence until the Pirates shrieked after the results were whispered into their group hug. There were many other notable performances. Brie Felnagle of Bellarmine Prep ran the fastest 1,600 in the nation at 4:47.71, sparked by a duel with Amanda Miller of Eastmont. Megan O’Reilly of Mt. Spokane was third in 4:57.59 and Amy Dahnke of University was fifth in 5:00.31. Felnagle came back to win the 800 in 2:10.44, just shy of the meet record of 2:10.15 by Ferris’ Missy Blackshire in 1997. Miller, the defending champion, faded to fourth with Central Valley junior Anna Layman getting third. Long jump champion Catie Schuetzle of Shadle Park was third in the triple jump at 37 feet, 1 1/2 inches. It was only a 3 1/2 -inch personal record, but a 17-inch improvement for the season. Garber ran his last high school mile with a little more passion than Friday’s tactical 3,200. He ended a two-year drought for the GSL by running 4:10.72 and is the first Mead runner to win since Skiy DeTray in 1995. In the end, finishing up a distance trip last done by Shadle Park’s Michael Kiter in 2001, wasn’t that difficult because of Garber’s kick and the absence of injured teammate Laef Barnes. Sophomore Skylar Jessen of Mead was third in the 100 and LC freshman Andre Jennings was third in the 200. Shadle Park senior Jared Bjerstrand, a second-year hurdler, was third in the 110 high hurdles. All three were one one-hundredth of a second out of second. CV senior Tasheen Garry was also third in the 300 hurdles and East Valley senior Andy Roof was third in the discus. Bryan Braman of Shadle Park was second in the high jump. Lewis and Clark was second in the 400 relay, just missing a school record with a 42.55. Cody Mace of Rogers won the wheelchair 100, 400, 1,500 and shot put. Alex McClary of Shelton set a meet record of 1:50.43 in the 800. Nate Rolfe of Inglemoor added the discus title to his shot put win, spinning a 190-2, 7 inches short of the meet record. Excessive wind kept a 49-9 1/4 triple jump by Kyle Jenkins of Jefferson from being a meet record.